The Tana Glacier, Wrangell - St. Elias National Park. 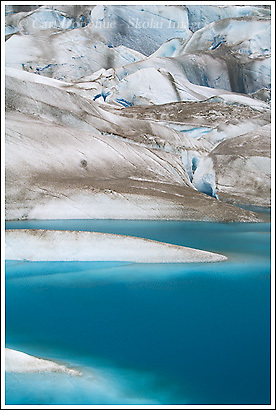 The Tana Glacier, Wrangell – St. Elias National Park. Here’s another image from the Tana Glacier – this one from our afternoon hiking around on the ice. We kinda found this little blue tarn by accident – I hadn’t seen it from the air, and didn’t see it at all until I nearly walked right into it. I hiked over this little crest and right beneath me is this incredible blue pond. I took a few images here, but it was drizzling rain most of the time, so I moved on up the glacier towards an ice cave I had seen from afar. In hindsight, I wish I’d spent more time at the tarn – the colors and patterns to be had were infinite. Glaciers really are a pot pourri for a photographer – they offer such an array of compositions, from close intimate abstract shots of patterns and colors to wider, expansive landscapes. They’re cool to shoot (now that’s a good pun! 🙂 ) from the air, and they’re great to shoot from on foot. This was my first time on the Tana Glacier, and it’s funny how each glacier has his/her own personality – they’re tons of fun. But it can also be dangerous to explore them, so if you head out in glacier country, be careful. This entry was posted in Abstract Photos, Adventures, Alaska, Backpacking and Hiking, Landscapes, Travel, Wrangell - St. Elias National Park on September 19, 2008 by Carl D.
I love the blue you find in a glacier pool – it has to be one of the more beautiful colors in nature. I agree with ya – glaciers are a blast to photograph. Good job. I’m looking forward to see your images from the cave. This looks like one sweet place Carl. Like Ron, I think “Glacial Blue” is one of the best colors out there. It is quite interesting the psychological effect that particular color makes in any image. I’ve often run across silty, brown lakes and pools on glaciers, or really small blue ones, but this was the first time I’ve really found a good sized pool. I SO wish the weather had been a little warmer for a dip. This is amazing. I absolutely love the cool blue waters you can find on the glaciers, but I’ve only had the opportunity to find 1 melt pond. This is an other-worldly image, of an other-worldly location. Thanks man – appreciate it. It really is an other-worldly location, for sure. Glaciers are awesome! Dude, it was raining. 🙂 Homey don’t swim in the rain, gnome sane? That is just the coolest pic. So very pretty!! Yeah, I wish I had more time to shoot this too – it was very cool. I was torn between continuing on and exploring further versus staying to shoot this some more. Then it was time to scoot back to camp. And the weather was atrocious. Thanks Beth, I appreciate it, as always.